Fixmart supplied the Kings Cross project with the Framo 80 modular system, used as wall-towall supports from which services and ceilings were suspended. Fixmart supplied the Kings Cross project with the Framo 80 modular system, used as wall-to-wall supports from which services and ceilings were suspended. These supports were erected in corridors and lobbies on the Kings Cross complex wherever York Stone was being used on the floors above. From these supports contractors suspended services, including all pipework and containment systems. In some of the corridors these supports were also used for suspending ceilings and finishing’s. Framo 80 is a multi-functional non-welded support system for the modular construction of framing solutions and was preferred for its versatility, labour saving properties and safe working benefits, as opposed to a traditional hot-worked steel structure. The 80 x 80mm box section with high torsion resistance allowed for strong volumetric carcasses in both construction and process industry applications and offered up to 80% weight saving compared with traditional steelwork profiles. 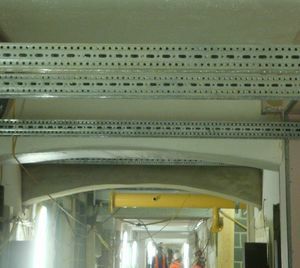 Being one of Fixmart’s London Underground approved product ranges the Framo 80 system proved to be a perfect solution to the particular problems faced on site. With a back up support service providing full indemnification and guaranteed quality. Having the stocks readily available and providing the back up support that Vinci required played a key part in successfully completing the job on time and ensured that the contractors saved on potential labour costs that would have been incurred if other methods had been used.